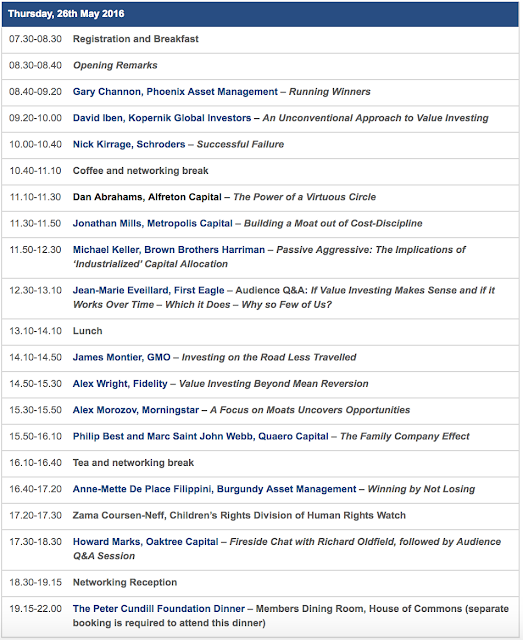 With just over two weeks to go until the fifth London Value Investor Conference on 26th May the final programme including presentation titles have now been announced. On the morning of the 26th, delegates will gather in the networking area for breakfast from 7.30am, with the conference opening remarks beginning at 8.30am. Shortly afterwards Gary Channon of Phoenix Asset Management will give the first presentation - titled "Running Winners". There will also be more than 10 investment ideas presented in detail at the conference this year, with some interesting topics presented and discussed, plus extensive audience Q&A sessions with both Howard Marks of Oaktree Capital and Jean-Marie Eveillard of First Eagle. There are still a limited number of tickets available for the conference but you need to book now if you want to attend - until Tuesday 17th May (or until tickets sell out). MarketFolly readers can get a discount of £120 (inc VAT) by using the code MARKETFOLLY-MAY when booking.